The Pioneer Award recognizes individuals that have shown a “pioneering passion” as competitors or through behind the scenes activities at the track, thus making their contribution a precious part of Volunteer Speedway history. 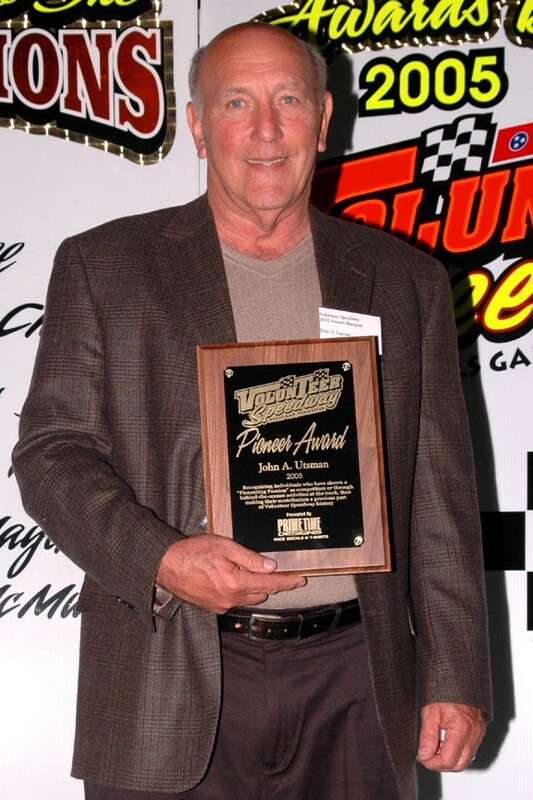 Primetime Designs’ Dean Jones presented the Pioneer Award to longtime racer Louis Hickey of Whitesburg. Hickey, called “Mr. Smooth” by many who watched him wheel a race car over the years, visited victory lane at Volunteer Speedway on many occasions first in the Bomber division, then behind the wheel of a Late Model, and he wound his racing career down chauffeuring an Open Wheel Modified. Also receiving the Pioneer Award was Morristown’s Buddy Hopson. Hopson Racing & Fabrication has been of service for many years to racers around the East Tennessee region, offering racing parts, and also building and repairing race cars. Walter Ball of Johnson City was presented the 2004 Pioneer Award by Primetime Designs’ Dean and Paula Jones. This true legend of the sport began his racing career in the mid-50s. Strapped in behind the wheel, once the green flag dropped he had only one thing in mind … WINNING!!!!! And by the time he hung his helmet up for the final time following the 1978 racing season, he had recorded over 400 feature wins. Plus he captured track championships at the old Sportsman Speedway in Johnson City, Appalachian Speedway in Kingsport, Davy Crockett Speedway in Rogersville, Newport Raceway in Newport, Richlands (VA) Raceway, and at Volunteer Speedway. 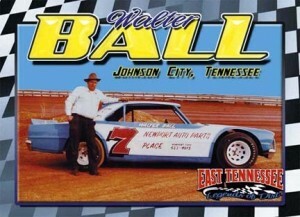 Besides racing on dirt at tracks all around East Tennessee, Southwest Virginia, North Carolina and Georgia during his career, he also competed in some NASCAR events on asphalt. From 1968 through 1971, the biggest dirt race held in the Southeast was the Tri-Cities 200, a 200-lap Late Model event. During the four-year time span, the first three races were held at Sportsman Speedway, with the ’71 event staged at Kingsport’s Appalachian Speedway. Ball won the inaugural Tri-Cities 200 in ’68 at Sportsman Speedway, and the ’71 running at Appalachian Speedway. He was headed to an apparent victory in the first race ever run at Volunteer Speedway, but the front bumper from another competitor sent him spinning between turns three and four on the white flag lap … thus giving the win to Danny Burks. But before his racing days were over, he captured several victories at “The Gap,” and one track championship, in 1977. He finished second in points the first two seasons the track was open, narrowly losing the 1976 title in the final race of the year to Red Ledford by the slim margin of four points. When you think of dominating performances in racing, this driver’s championship-winning campaign at Volunteer Speedway in 1977 most definitely defined the word “DOMINANCE!” Putting up numbers that have never been approached since, he recorded 19 feature wins in 21 starts. The talk in the pits and the stands each week prior to the night of racing was, “Do you reckon Walter Ball will get beat tonight?” Well, he only got beat two times the entire season. H.E. Vineyard, a four-time track champion, chased this driver to the checkers and finished in second-place on 15 occasions in 1977. The battles they staged between themselves, and with “Little” Bill Corum, Tootle Estes, Herman Goddard and Bill Morton are legendary. Walter and his son (Dale Ball) hold the distinguished honor of being the only father-son racers to have been crowned Late Model champions at Volunteer Speedway. Herman captured the 1990 Super Late Model track championship at Volunteer Speedway. 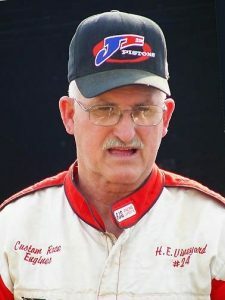 Goddard thrilled everyone in attendance at Volunteer Speedway on August 14, 2004, at 68 years old, by winning the Super Late Model feature. 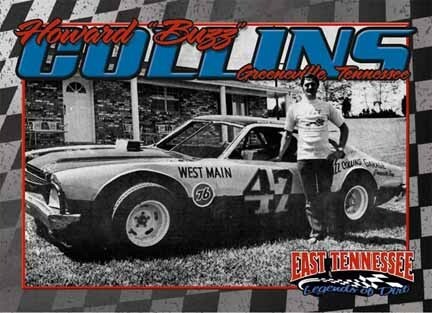 This victory would be the last of over 500 feature wins at track all around the East Tennessee region for Goddard during his racing career. 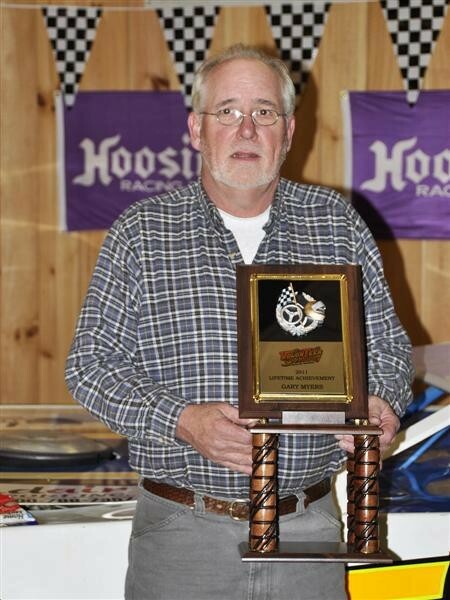 Besides winning many races over the years, along with etching his name in the record book as a track champion … Goddard has always exhibited true sportsmanship and has been a tremendous supporter of Volunteer Speedway. 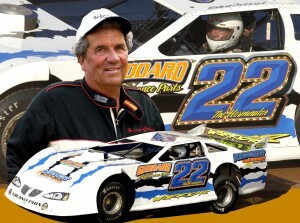 The Goddard family name is also associated with Goddard Performance Parts and Warrior Race Cars, located in Knoxville. In 2008, Goddard was enshrined into the National Dirt Late Model Hall of Fame, which is located in Walton, Ky., on the grounds at Florence Speedway. 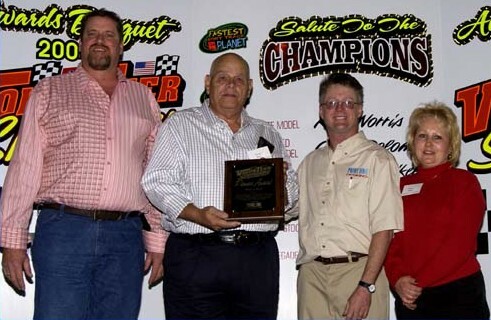 The Pioneer Award, recognizing individuals that have shown a “pioneering passion” as competitors or through behind the scenes activities at the track, thus making their contribution a precious part of Volunteer Speedway history … was presented by Primetime Designs’ Dean Jones to legendary racer John A. Utsman of Bluff City. John A. is just one of many Utsman family members that have raced in East Tennessee over the years, which include “Pappy” John, W. A. “Dub,” Sherman, Layman, Gerald, Cecil, Larry, Cecil Jr. “Junior,” Ricky and his son-Brandon, Layman’s grandsons Heath and Cody Gunning. plus Layman’s step-son Rod Collins. 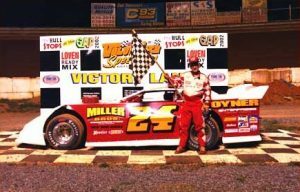 John A. captured the Volunteer Speedway Super Late Model championship in 1993, while also doubling up that same season to win the Kingsport Speedway title. All totaled, during his dual-championship winning campaign in ’93 he visited victory lane on 18 occasions. During his illustrious 40-year racing career, his talent behind the wheel carried him to three starts in the prestigious NASCAR Winston Cup Series Daytona 500 at the Daytona International Speedway, many NASCAR Late Model Sportsman and Busch Series starts, plus several track championships around East Tennessee and Southwest Virginia, and over 300 career victories. 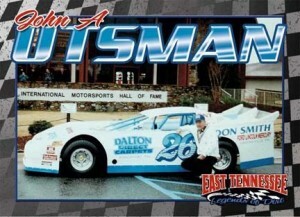 Utsman also holds the distinction of having had the first-ever dirt Late Model car enshrined into the International Motorsport Hall of Fame, which is located out front of the Talladega Superspeedway in Alabama. 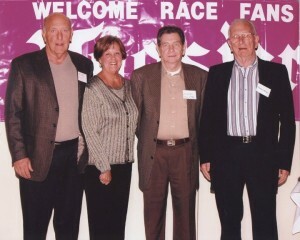 Left to Right: John A. Utsman, Ann Utsman (John A.’s wife), Layman Utsman and Sherman Utsman in 2005 at the Volunteer Speedway banquet at Meadowview Conference & Resort in Kingsport. 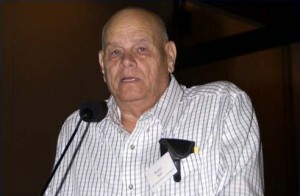 The Lifetime Achievement Award was presented to Bill Ledger. 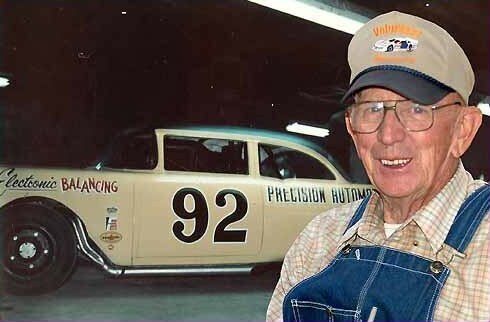 Ledger, who resides in Weber City, Va., and was born June 28, 1922 – first sat behind the wheel of a race car in 1939 at the old Greenback (Tenn.) Speedway. 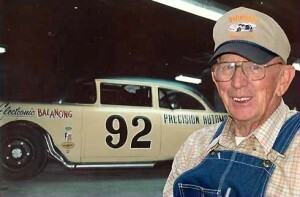 During his off-and-on racing career spanning from ’39 to 1969 he competed at many tracks all around Tennessee, Georgia, North Carolina, South Carolina, Virginia, Kentucky and Maryland. After turning driving duties over to his nephew (Jack Thompson), Bill helped promote Kingsport (Tenn.) Speedway under the NASCAR banner from 1969-’78 for longtime track owner Ken Murray. Some of Ledger’s longtime racing friends/partners over the years include Claude Lay, Ken “Bear” Hunley, Paul Gose, Walter Ball, Tootle Estes, the Utsmans (Pappy John, W.A. – Dub, Sherman, John A., Layman, Cecil, Ricky), Paul Lewis, Gene Glover, Bill Morton, Chester Clendenin, Claude Donovan, Jack Cannon, Dan Jeter, Wayne Snow, Chet Williams, plus many more. The Lifetime Achievement Award recognized Robert Walden, from Johnson City, Tenn. Walden has spent over 30 years working in motorsports promotions behind the scenes; in public relations with dirt and asphalt racing touring series, along with representing several drivers and race teams handling their PR duties, plus working at different tracks around the East Tennessee region. 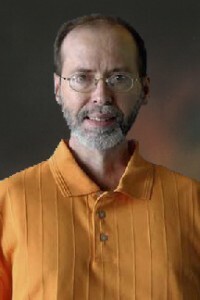 Since the late 1970s he’s also worked closely with several national and regional motorsports publications as a journalist, plus penned a weekly NASCAR column for various newspaper media outlets, and also co-hosted a weekly racing show on Tri-Cities sports talk radio for a decade, from 1988 through 1998. Since 1994 he’s served as Media/Public Relations director at Volunteer Speedway. From 1998 through the 2002 season he handled Media/Public Relations at NASCAR sanctioned Kingsport Speedway while the track was still hosting weekly racing. When the track cranked back up for full-time racing in 2011 after having sat closed for eight years, he once again stepped back into the role of Media/Public Relations Director at the .375-mile banked concrete oval in the Model City he nicknamed “The Concrete Jungle.” During the mid-1990s he also teamed up with a partner to launch a local, all-sports weekly publication in the Northeast Tennessee region that was in operation for five years, before selling out to tackle other endeavors. The Lifetime Achievement Award recognized Dan Jeter, whose involvement in racing goes back to the 1960s. Jeter was a NASCAR scorer in the stock car racing series’ early beginnings, and over the years he also worked at local tracks in the region such as Sportsman Speedway, Appalachian Speedway, Kingsport Speedway and Lonesome Pine Raceway. 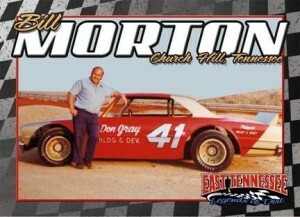 He also helped out legendary drivers from the region such as Ken “Bear” Hunley, Gene Glover, Bill Morton and L.D. Ottinger. 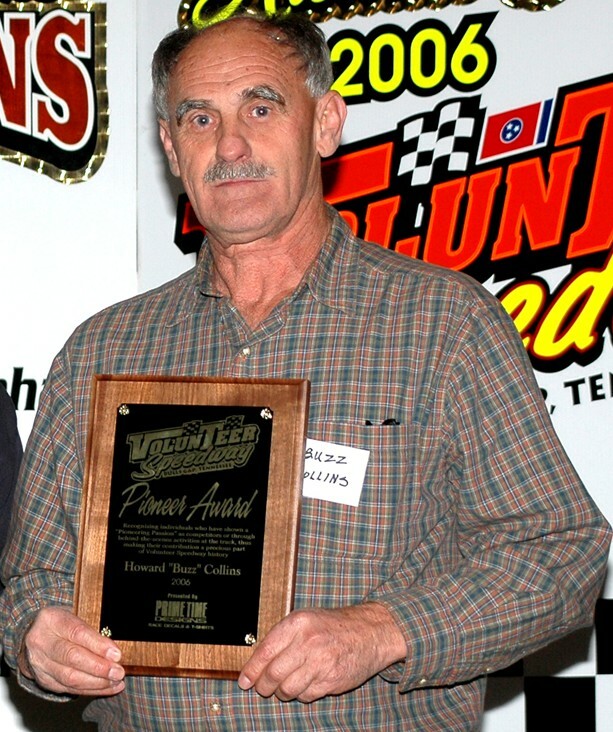 The Pioneer Award, recognizing individuals that have shown a “pioneering passion” as competitors or through behind the scenes activities at the track, thus making their contribution a precious part of Volunteer Speedway history … was presented by Primetime Designs’ Dean Jones to Howard “Buzz” Collins of Greeneville. Collins’ accomplishments behind the wheel of a race car indeed earned him the honor of being called a legend in the sport. His racing career spanned 25 years — from 1970 through the 1995 season. By the time he hung his helmet up he had visited victory lane 460 times — and had captured 14 track championships along the way. Collins, a Greene County native who was born April 24, 1940, started racing in 1970 after he had moved from East Tennessee to the Chicago, Ill., area. Competing at Santa Fe Speedway, in the Windy City suburb of Hinsdale, he captured the track’s Figure 8 championship for the ’70 season, and in 1971 he was crowned the Sportsman division champion. Calling Volunteer Speedway his home-track, and also competing at Newport Raceway, between 1975 and 1983 Buzz won (six) 6-Cylinder championships at “The Gap” and (three) 6-Cylinder titles at Newport. 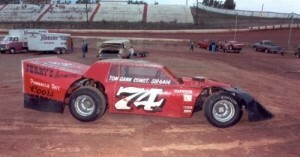 In 1984 Collins won the Late Model championship at Newport Raceway. In 1985 he doubled-up, winning the Late Model titles at both Volunteer Speedway and Newport Raceway. 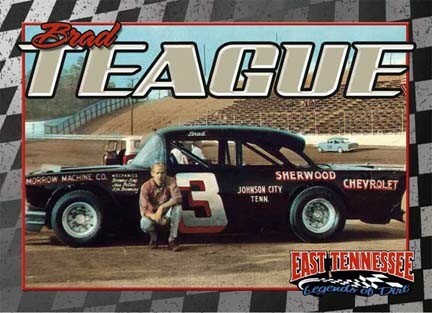 Over the years besides competing at Volunteer Speedway and Newport Raceway, he also raced at the old Sportsman Speedway in Johnson City, Appalachian Speedway in Kingsport, Davy Crockett Speedway in Rogersville, Tazewell Speedway, Kingsport Speedway, and Smoky Mountain Speedway in Maryville. To say racing was, and still is in his blood, is an understatement. Even though he’s no longer wheeling a race car around the high banks at Volunteer Speedway, you will still see the 2006 Pioneer Award recipient Collins sitting in the grandstands enjoying the racing action every Saturday night. The 2011 Volunteer Speedway Lifetime Achievement Award was presented to Gary Myers of Greeneville. Myers’ accomplishments in racing speak for themselves. He began building racing engines in 1976, and to quench his need for speed he first strapped in behind the wheel of a race car in 1979. 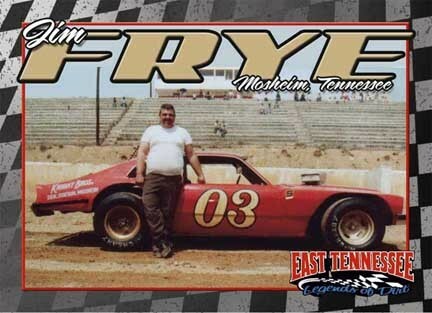 Before hanging his helmet up for the final time following the 1993 racing season, Myers would visit victory lane on 104 occasions and capture Late Model track championships at Volunteer Speedway (1992), Kingsport Speedway (1985), and Newport Speedway in 1987. 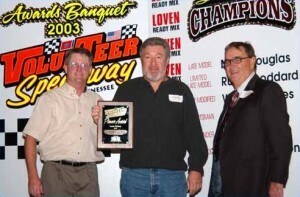 Over the years Myers visited victory lane while competing in the 6-Cylinder division and also Late Model class at not only Volunteer Speedway, but at Kingsport Speedway, Newport Speedway, the old Davy Crockett Speedway in Rogersville, Smoky Mountain Speedway (Maryville), and also on the Indian reservation at Smoky Mountain Raceway in Cherokee, N.C.
A lot of racers’ will go through periods in their racing career when it just seems like everything goes their way, and they enjoy tremendous success. 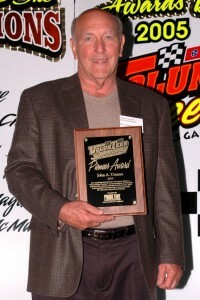 This year’s Lifetime Achievement Award recipient experienced great success chauffeuring the Barry Wright Race Cars dirt Late Model with the words “Wild Thang” along the sides of the car, when he got on a hot streak and won 17 consecutive races between Volunteer Speedway, Kingsport Speedway and Smoky Mountain Speedway. The very first weekend he raced the “Wild Thang,” he won back-to-back races – first at Kingsport Speedway ($3,000 victory) on Friday, and then on Saturday he recorded a $5,000 victory at Volunteer Speedway. The $8,000 haul for the two nights of racing during that era in motorsports was enough to actually pay for the car in one weekend. Undoubtedly the biggest win of his career occurred on the high banks at Volunteer Speedway, when he outran the national touring drivers with the Hav-A-Tampa Dirt Racing Series to visit victory lane in the first-ever HAT event at The Gap. Racing for Myers was always a family affair, with his father (Fred) and brother (Danny) always helping at the track, and also back in the shop during the week working on the race car. With his son (Josh) having raced go-karts for the past 14 years, the father-son combination have won many races and championships. Plus, he still maintains a close connection to racers (round-track, drag racing, along with tractor and truck pulling machines) around East Tennessee through his business – Myers Engine & Machine (423-638-2579), located on Asheville Highway in Greeneville, building high-performance racing engines. 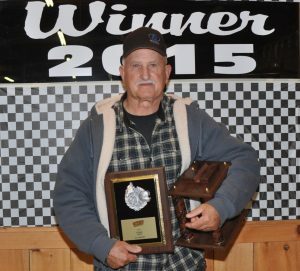 On Saturday, Nov. 14, 2015, Volunteer Speedway proudly recognized a true racing legend. The Pioneer Award is presented annually to a former racer or to a behind-the-scenes person (car owner, crew member, track worker, engine builder, etc.). H.E. Vineyard of Powell, Tenn., received the Pioneer Award to a standing ovation from all in attendance. You will hear many people say that Vineyard “was the best race car driver ever” in East Tennessee. … One thing is for certain – his credentials during an illustrious racing career spanning five decades are quite impressive to say the least as he won several track championships and hundreds of races around East Tennessee. 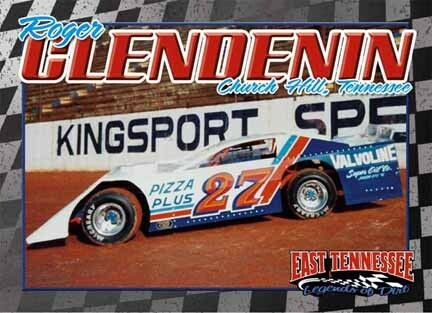 Vineyard is a member of the East Tennessee Racing Hall of Fame, plus he was inducted into the National Dirt Late Model Hall of Fame in Florence, Ky., in 2007. 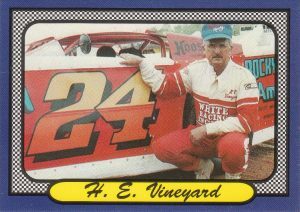 Vineyard played an important role in the history of Volunteer Speedway with four track championships in 1978, 1979, 1981 and 1984. He recorded his last victory at “The Gap” back on June 8, 2002 at age 64. H.E. Vineyard, it’s a tremendous honor and privilege for Volunteer Speedway to induct you into the Hall of Fame!